Menlo-Atherton Academy of Contemporary Music | Music for our Future. Now. Founded by Dr. Jason Federmeyer and Dr. Alexander Sigman, the Menlo-Atherton Academy of Contemporary Music (MAACM) is a community-based organization that offers exciting opportunities for San Francisco Bay Area Peninsula high school students and members of the public to experience cutting edge contemporary music. In collaboration with the City of Menlo Park, the Sequoia Union High School District, and the administration of Menlo-Atherton High School, the events of MAACM will be presented by a diverse array of distinguished guest artists. The semi-monthly series of workshops, lecture-demonstrations and concerts, will engage and expose participants to the vitality and variety of 20th and 21st century music through hands-on activities in a supportive, inclusive environment. Combining elements of innovative composition, improvisation, and technology, the workshops and masterclasses will be geared towards the novice and the experienced musician alike. Join us at the state-of-the-art Menlo-Atherton Performing Arts center as we engage in the music of our time. Stay tune for updates on our 2011-2012 season! 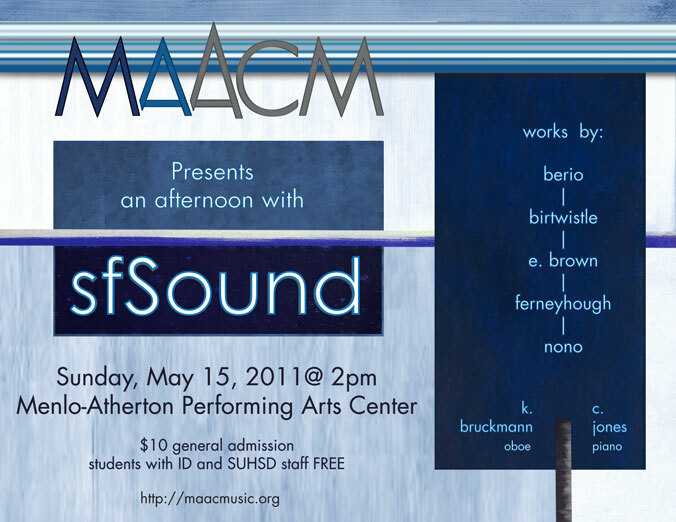 Sunday, May 15, 2011: sfSound, featuring Kyle Bruckmann, oboe, and Chris Jones, piano. Tickets: $10 general admission; FREE for students with ID and SUHSD staff. For information about our recent events, click here.